In 1860, Bill Holcomb started a Gold Rush that began bringing people into the Big Bear valley in significant numbers for the first time. Within just a few months of his discovery, the once secluded Big Bear/Holcomb valley area had the highest concentration people in all of San Bernardino county. But by 1862, the excitement had fizzled out, and most of the miners had given up and gone elsewhere. The problem wasn’t due to a lack of gold, but a lack of water. It was going to take specialized equipment and “big money” to recover gold from the Big Bear / Holcomb Valley area. One of those “big money” efforts actually started a second gold rush. This second “gold rush” was sparked by a wealthy man by the name of Elias J. (Lucky) Baldwin. Lucky Baldwin, a multimillionaire who had originally made his fortune in the Ophir Mine in Nevada. In 1873, Baldwin began quietly investigating the mining possibilities in the Big Bear Lake area. He eventually purchased an existing claim on the mountain slopes at the north/east end of what is now Baldwin Lake for $30,000. He then incorporated the Gold Mountain Mining Company, and began construction of a huge 40 stamp mill at the base of today’s Gold Mountain. Word spread quickly of a new discovery by Lucky Baldwin at Big Bear. Soon exaggerated reports testifying to the quality of his gold claim fueled the excitement. The Guardian reported on September 12, 1874, that Baldwin’s Gold Mountain in Big Bear was a “…. mineralogical miracle” and went on to say “…. we have never heard or read of a similar discovery ….the crown of the mountain is a mass of gold bearing rock….”. 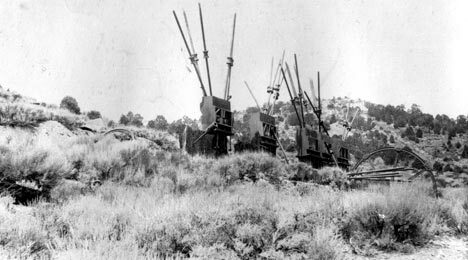 Baldwin’s new company carved out a road from Cactus Flats to Big Bear, and began hauling in machinery and parts for the huge 40-stamp mill. Overnight a town called Bairdstown popped into existence at the base of Gold Mountain. In September of 1874, the new community had a blacksmith shop, a butcher shop, two boarding houses, and two saloons. By spring, Bairdstown had grown to include three general stores, two livery stables, three restaurants, two hotels, several saloons, a black smith shop, a bakery, a meat market, a Chinese wash house, a tailor, a shoemaker, a barber, and even a cemetery. As with most mining towns, fist fights and shootings were regular events, and the cemetery always had an occasional customer. By 1875, the great 40-stamp mill was finished and ready for operation. Lucky Baldwin arrived in Big Bear on March 6, 1875, and fired up the new $250,000 steam powered stamp mill for the first time. The deafening sound of the heavy stamps reverberated throughout every corner of Big Bear valley as he started processing 100 tons of ore a day. After two months of intense operation the results were disappointing. It looked like that the top of that Gold Mountain might not be made of gold after all. In fact the ore being processed was of such low quality that it was barely paying the overhead. An unhappy Baldwin decided to shut down half of the mills 40 stamps, and continue operation on a reduced scale. Finally, on October of 1875, he shut the mill down completely. After only 8 months of operation, Big Bear’s second gold rush was over. Overnight, Bairdstown became a ghost town. The stamp mill would sit dormant for almost two years until August 14, 1878, when a fire mysteriously broke out completely destroying the mill. 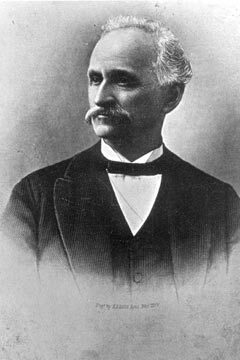 “Lucky” Baldwin retained ownership of his Gold Mountain claims, but swore that he would never invest another dime of his own money into Gold Mountain. Many years later in 1899, a man by the name of Captain J.R. DeLaMar approached Lucky Baldwin with a plan to build a new stamp mill and reopen the Gold Mountain Mines in Big Bear. To everyone’s surprise, Baldwin agreed. DeLaMar was under no illusion as to the quality of the ore on Gold Mountain. He was betting on two things for success: 1) He felt that the rich “mother lode” that everyone had been looking for was still there, and 2) he planned to incorporate a new technology for recovering gold, called a “cyanide process”. DeLaMar felt that this cyanide process would allow his operation to turn a profit by greatly increasing the amount of gold recovered from Gold Mountains low grade ore. In the mean time he would continually look for that “mother lode” he thought everyone had missed. 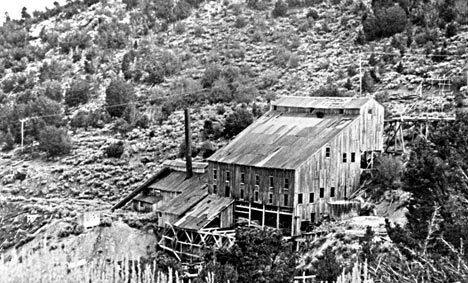 DeLaMar’s new 40 stamp mill in Big Bear was located higher up on the side of Gold Mountain just above the ruins of the original burned out mill. Once again, Bairdstown sprang back to life. The new mill began operating at a feverish pace. For over two years, it aggressively processed 130 tons of ore every 24 hours, night and day. DeLaMar’s efforts actually managed to turn a small profit, but that elusive “mother lode” he so desperately wanted was never found. DeLaMar ceased his operations in 1903, and Bairdstown, which had since been renamed Doble, once again reverted back to a ghost town. From the early 1900’s through the late 1940’s, different companies and individuals would occasionally step forward to invest time and money in reopening Baldwin’s Gold Mountain mines in Big Bear, but always with little success. Today, you can wander through the concrete ruins of DeLaMar’s stamp mill, and the old cemetery still exists to mark the spot where Bairdstown was once located. Gold Mountain wasn’t the only “big money” mining operation in these mountains. 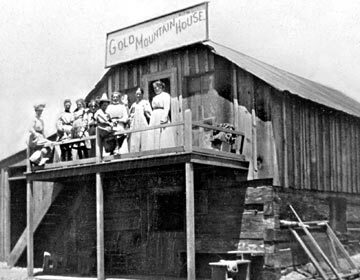 Part 3 of this Big Bear Gold Rush series will take a look at an unusual mining operation in Holcomb Valley, and the famous Rose Mine.